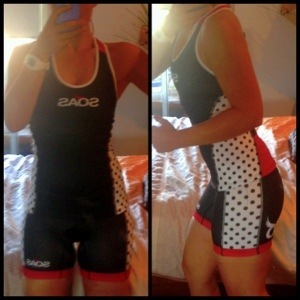 Well, I waited nearly 12 months to purchase my dream triathlon kit, but u finally have it! After a long delay with the postage I had been considering sending it back as soon as it arrived, that consideration was negated as soon as I laid hands on it! I know not all of you will be into the pink and polka dots that had me instantly fall in love with this super cute design. But that’s not all that’s great about this kit (check out their other designs). 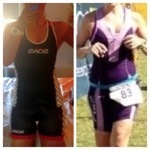 My disclaimer is I haven’t raced in this suit (YET) but I will be for my very next race! I HAVE however cycled to and from work 3 times (=120kms) and done some sprints and a gym session in it. Amazing colour selections- plenty of options to suit your personal taste! Comfort: As I said above I am yet to race in the kit, but the 120kms I have cycled in it have been my most comfortable yet (even better than my thick padded pearl isumi cycling pants!) which was a huge surprise to me! More details on the chamois below, but the design in general is easy to move in, comfy on the saddle region and does very little ‘riding up’. Racer Back -Not only contributes to the flattering design but also allows for ease of upper body movements. Internal Shelf Bra – I’m not sure this would provide enough support for me not to wear a sports bra/crop (although I like to be strapped in tight when running), but it definitely provides additional support. It is double lined with a black material so those that want to go ‘commando’ don’t have to worry about showing the world what their mumma’s gave them ! Pockets – The top has 2 deep pockets on the lower back perfect for stashing gels, inner tubes or anything else you may need for you race/training. Design – I have already touched in most if this but top specific design strengths would be the length of the top. I have had no issues with it riding up (even with a backpack on). The length also contributes to just how flattering this kit is! Design – I love these shorts and they are the only ‘bike shorts’ I’m comfortable wearing in public. This comes largely down to the wide fabric bands around the waist and legs that prevent bulging and muffin tops! Pockets– the pants also have 3 shallow pockets perfect for fuel or trash whilst on course! ← Live for Today, Train for Tomorrow! I love my soas suit. I have worn it for every tri since. Will buy more when I can afford. Despite the thin fleece chamois it’s very comfortable and most importantly very flattering! Hi! Thanks for this review. I am planning on getting one of their kits but was wondering if you experienced any drag on the swim due to the pockets? Thanks! Hi Jodie. No drag at all with the pockets. I absolutely love this kit.